Learning to drive with Steve was my best decision! 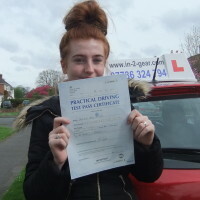 After struggling to pass my driving test on previous occasions, Steve gave me the confidence I needed to complete my driving test with a positive attitude, and I passed first time with him! He gave me lots of driving and parking tips which were not only useful in my driving test but for life. Thankyou so much!